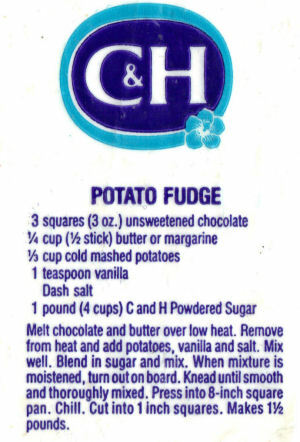 This promo recipe was clipped from a bag of C&H powdered sugar and found in a large collection, date unknown. I’ve typed it below along with a scanned copy. Melt chocolate and butter over low heat. Remove from heat and add potatoes, vanilla and salt. Mix well. Blend in sugar and mix. When mixture is moistened, turn out on board. Knead until smooth and thoroughly mixed. Press into 8-inch square pan. Chill. Cut into 1 inch squares. Makes 1 1/2 pounds.